Turks and Caicos iguanas are the largest native terrestrial vertebrates and dominant herbivores in the Turks and Caicos Islands (TCI), which is comprised of more than 200 individual islands. Due to increasing human development and the introduction of non-native, mammalian predators and competitors, these iguanas, once found throughout the 200+ islands comprising the Turks and Caicos, now occupy less than 5% of their historic range. 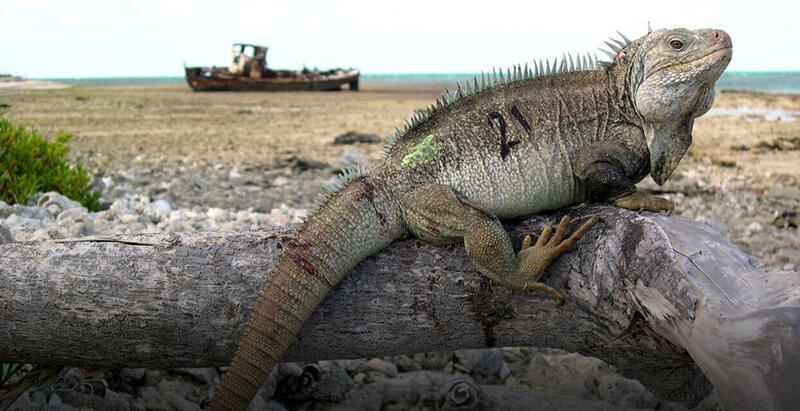 Together with our partners, we are working with developers and owners of private islands to find ways for iguanas and people to coexist. We are also working to remove feral mammals from small islands that are part of the TCI national reserve system so that the habitat can be restored and iguanas can be reintroduced. To date, feral mammals have been removed from five islands and iguanas have been successfully reintroduced to six islands. To increase our knowledge of iguanas, our Population Sustainability team is studying their ecology, behavior, and population genetics. We have long-term population studies on several islands where we have marked as many individual iguanas as possible, allowing us to measure reproduction, growth, and survival rates. On Big Ambergris Cay, a privately owned island with the largest remaining iguana population in the TCI, we assisted our partners with a series of experimental translocations to investigate iguana homing behavior and formulate a science-based strategy for moving iguanas away from areas slated for development. With additional colleagues, we are investigating genetic diversity within and among island populations. These studies are allowing us to better understand the effects of small population size on population health, and to identify patterns of diversity among island populations most in need of preservation. To foster greater awareness of iguanas among the public and increase the capacity of our local conservation partners, we are actively engaged in education, outreach, and capacity building activities. These include installing educational signs on islands, producing displays for the Turks and Caicos National Environmental Center, conducting workshops for local educators and environmental professionals, and publishing popular articles in local magazines.